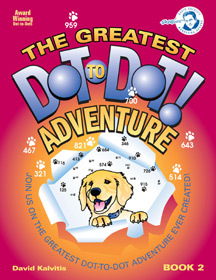 You are indubitably familiar with our rave review of David Kalvitis’ The Greatest Dot-to-Dot Adventure. I suggest you read the review so you can prepare yourself emotionally for the second coming. Well, the second book in the series. What seems to us to be consistently amazing is how he keeps coming up with new kinds of dot-to-dot puzzles. Some of the challenges are really challenging. It’s not just dot-to-dot, it’s dot-to-OMG-to-dot. There are four-page puzzles. Three-page puzzles. There’s a puzzle where you connect the coordinates and another where instead of dots you have words, and you connect them alphabetically. And then there’s the adventure – a picture story that only becomes clear after you’ve completed all the puzzles. One reward after another. This is the second in Kalvatis’ Dot-to-Dot Adventure series. The first also earned a Major Fun award. And in all of his work, it’s quality of the drawings themselves that makes the fun so major: always surprisingly masterful, and deeply satisfying when you complete them – satisfying enough to entice your resident artist (my wife) to making that extra artist effort to color them in.